Out this week on PSN is a little gem for the PSP that I've been looking forward to for quite a while now. ClaDun x2 is the sequel to 2010's ClaDun: This Is An RPG. It's an amusing dungeon crawling RPG with lots to do, not to mention slapstick humour, a unique skill progression system, a deep and flexible suite of customization tools and, oh, did I mention infinite replay value? Developed by System Prism, a subsidiary of Nippon Ichi Software, and localized by its Western arm NIS America, ClaDun x2 touts double the content and double the fun. Something you wouldn't think possible considering how much the first game already offered for its incredibly low price, especially in comparison to other PSP games on the market. We'll be going through why exactly you PSP owners should add this to your shopping list if you haven't already bought it. The original game came out late last year. It's an adorable little action RPG game with visuals that are reminiscent of the 8-bit era. Set in the world of Arcanus Cella, players can customize their main characters and even the final boss. While the main story dungeons are set pieces, Ran-geons are entirely randomly generated with players being able to venture as deep as they can possibly go. The deeper you venture into a dungeon, the more substantial your loot becomes. This is where the infinite replay value comes in, as there's always something new to explore. Well there must be more to it than that! There sure is. ClaDun features a unique skill progression system known as Magic Circles. Not only do you improve one character's abilities, you progress whomever is in the circle that you're using. Other characters that you include in a circle are essentially meat shields for the one that you're using, absorbing damage from monsters and the like. In addition, it's not the character that you're using that will reap the benefits of the Magic Circle, instead the meat shields are the ones that get improved stats. In essence, in order to create your perfect character, you're going to have to play as someone else. A strange, but humorous mechanic for sure. Players were also given the opportunity to dungeon crawl with their friends as the game supported co-op with up to four players via the PSP's ad hoc function. How about that customization you mentioned? The character customization tool is a surprisingly deep and well-built feature, but also really easy to use. 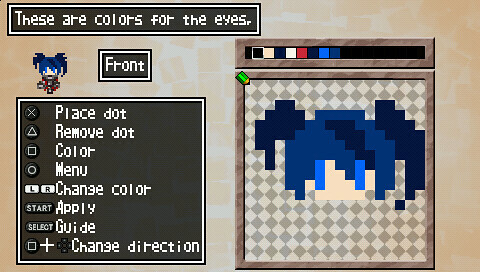 Players can create pretty much any character they like using class templates, pixel for pixel. Needless to say, I've created Etna from the Disgaea series as well as Barret Wallace from Final Fantasy VII. The inner anime nerd in me also farted out Black Rock Shooter from, well, Black Rock Shooter. So what's new in ClaDun x2? Nippon Ichi have built on top of the core mechanics, adding even more than what was already there. Customization isn't just limited to character heads. Players can create whatever they want, pixel for pixel, from head to toe. Not only that, customization has spread to weapons, equipment and even the music. Moreover, you can create relationships between characters. In addition to the main dungeons, Ran-geons make a return alongside new dungeon types: Tri-geons and Neo-geons! Tri-geons have three states, Normal, Chaos and Heaven, and it packs more powerful monsters as well as more valuable items. Each Tri-geon is connected via a hallway. Neo-geons are just like Ran-geons except you find them through gates scattered throughout other dungeons. New to ClaDun x2 are also several new classes to pick from, including Swordmage, Ninja and Shaman. Unique to each class is a job skill that will buff up your character or give them access to deadly abilities. Speaking of which, further enhancement can be accomplished via attaching Titles to equipment. ClaDun x2 is out now on PSN for only $19.99. Be sure to watch out for our review of the game later this week.